“Unusual Summertime Warming” off California Coast – Neptune 911! Whale Shark. Photo by Brian J. Skerry for National Geographic. 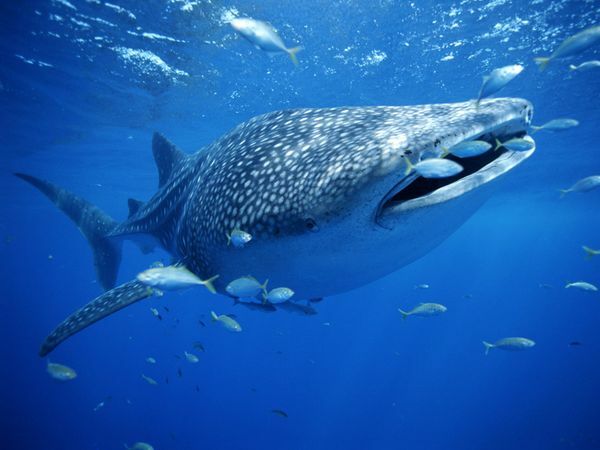 A recent whale shark siting off of Catalina Island is likely due to warmer California waters. Visit Neptune 911 for Kids, for a “kids version” of this story. Recently an episode of intensified coastal warming off California has been detected in satellite sea surface temperature (SST) imagery along many portions of central-to-southern California and down to Baja California. This is an ongoing and highly unusual event during a seasonal period that is typically associated with strong coastal upwelling of cool subsurface water that chills the coastal zone. The magnitude of the warming, up to 4-5ºC, has not been seen in recent years. Coastal upwelling is driven by equatorward alongshore winds that push warmer surface water offshore and draw cooler subsurface water up to the surface layer. Upwelling along central-to-southern California (and Baja) during the spring-summer period provides a seasonal ecological environment beneficial to the marine ecosystems from phytoplankton to fisheries. Figure 1. MUR SST anomaly animation from June – August 2014 depicting regional warming events in July and August. A daily climatological mean SST (based on the 10 year MUR time series) is subtracted from each daily SST image in this time series. An SST animation (Fig. 1) using the 1-km Multi-scale Ultra-high Resolution (MUR) Level 4 SST product shows both the extent and regional intensity of the SST anomalies (deviation of SST from a 10 year averaged seasonal reference). From July to August, large SST anomalies up to 4-5ºC were observed in the coastal waters. The magnitude of this warming is the largest in the past decade. But what caused the warming? Blame it on the winds, and perhaps also on a positive feedback loop involving regional ocean and weather patterns. A recent study by Yuan and Yamagata (2014) explained the nature of interannual variation of summertime SST off southern and Baja California through an intrinsic air-sea coupling mechanism that is characterized by a positive feedback between wind and SST. For example, the initial weakening of the equatorward along-shore wind weakens the upwelling and induces a positive SST anomaly. The latter lowers the atmospheric pressure near the coast and results in a cross-shelf atmospheric pressure gradient. This pressure gradient weakens the along-shore wind further and enhances the positive SST anomaly. Yuan and Yamagata (2014) coined this phenomenon the California Niño/Niña because the positive feedback mechanism is akin to that associated with the tropical El Niño/La Niña phenomenon that impacts global weather patterns. Satellite observations also highlight the fact that the SST spatial gradient field is clearly impacted by the warming with reduced gradients often (but not always) found in the warmer regions. Scientists and many others interested in our ocean are paying close attention to this warming because of its importance to marine life. For instance, warming of the upper ocean usually comes with changes in the plankton and fish community that you find along the California coast. If the warming persists for the rest of the summer into the fall, we might expect to see more subtropical species, like ocean sunfish, albacore, dorado, yellowtail, yellowfin or bluefin tuna, or humboldt squid, moving into nearshore waters that they typically avoid when it is colder. These subtropical species have been seen in the nearshore waters along the coast of California, Oregon, Washington, British Columbia and even Alaska in some of the warmest conditions of recent summers and falls (e.g., 1997). Additionally, some of the species that do well in colder, more productive waters could suffer reduced growth, poor reproductive success, and population declines. This has happened to marine mammals, sea birds, and Pacific salmon in the past. At the same time, species that do well in warmer conditions may experience increased growth, survival and abundance. The California sardine is one important species that may benefit from an extended warm period in our coastal ocean. There have been many reports of warm water species being caught in Southern California this summer, where the ocean has been especially warm since late winter. Many jelly fish called “sea nettles” (or Chrysaora Fuscenscens) and ocean sunfish were observed during a mid-July NOAA trawl survey between San Francisco and Monterey Bay. These were good indicators that the warm upper ocean waters brought some of the weaker swimming offshore critters inshore. Catches of juvenile salmon were also very low in this area that usually has a relative abundance of them. It might indicate that the cold water species like salmon were at greater depths, where the water was still cold but beyond the reach of the nets. More recently there have been widespread beach strandings of “by the wind sailors” (velella velella), jelly-like creatures that drift with the wind and surface currents. It has been an especially interesting summer for the Pacific climate because this spring many indicators pointed to the development of a strong tropical El Niño. But in the past two months conditions along the equator have subsided, and now a weak or only moderate strength El Niño is expected to develop this fall and winter. If the tropical Pacific does warm up and turn into an El Niño this fall and winter, it would likely reinforce and spread the existing warming along the Pacific coast into next winter and spring. If that happens, impacts on marine life would definitely carry over into next spring and early summer. It would be a double-whammy of bad news for California’s Pacific salmon that are currently under stress in their freshwater habitats from the ongoing drought.